Qosmotec has released an App for the new 2018 edition of Aachen 2025 event today. 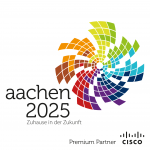 The event intends to show the impacts of digitalization to citizens in Aachen. More than 100 people from Aachen university, industrial associations and small and medium enterprises in Aachen are participating in the organization of the event, which takes place on Fraiday and Saturday, September 28th and 29th. The event has been taking place already once in 2016. More than 15.000 guest have been visiting the 40 event locations spread all over Aachen. This year, the event will take place more centralized in 5 locations in Aachen with the technology center at Europaplatz in Aachen as main event place. Yet, the program for the event in September is not fixed. Nevertheless, the app fulfills already now a useful purpose. All participating organizations will announce events about digitalizations (lectures, workshops, presentations, etc.) in the Aachen 2025 App from now on. Checkout the app description on the Lobadi-Website for further details.